Here’s a dictionary definition of a treadmill. “A machine for walking and running while staying in one place.” Now, why would anyone want to do that? Surely the whole purpose of being equipped to walk and run is to take us from one place to another. Well, there are sensible reasons for using a treadmill, which I’ll tell you about later. When my husband and I decided to buy a treadmill we soon found ourselves entering a brave new world. Did you know that there are numerous kinds of treadmill from the basic bag-of-chips and pint of lager type right up to the caviar and champagne type? Did we want a fold-up model, a motorised treadmill with adjustable speeds, inclines, set workouts, manual operations, safety devices, a display window showing miles, speed and calories used, a device for monitoring heart rate, a fan, a place to put a water bottle, a plug-in socket for an MP3 player, CD or radio. Yes, but … will it make me a cup of tea when I’ve finished and go fetch my slippers? “Have you ever used a treadmill before?” the man at the showroom asked. Actually I had. I’d used one some years ago at a gym and fallen off it. That was Will Young’s fault. I got distracted watching TV, listening to Will Young singing ‘I think I’d better leave right now.’ And leave right now I did. By stumbling to my knees and being shunted along the moving belt to fall off the back of the treadmill, ending up with my bottom stuck in the air. It doesn’t seem fair, does it? Doing something to improve health and ending up with a very sore knee – and a very red face. “Yes, it’s easy to assemble,” the salesman told us. “Won’t take more than half-an hour. Anyone could do it.” But when we saw the four pages of complicated looking instructions, we decided it was worth paying extra to have it assembled for us. To save money, we booked a one-man delivery, with Ian agreeing to be there when it arrived to help the delivery man bring it inside. Due to a mix-up about the arrival time, I was in on my own when it came. With the help of a female neighbour (where are the big strong males on those rare occasions when you need one?) the three of us struggled to get it onto our driveway. Flippin’ big heavy thing! Why did it look far bigger outside our house than it had in the showroom? ‘Don’t let it get wet or you’ll damage it,” were the delivery man’s parting words, shaking his head at me and at the uncovered machine that stood up, proud and tall, in its fold-up position in the middle of the driveway. And of course the sky promptly opened up and began a heavy downpour over hundreds of pounds worth of heavy metal. In a panic I dashed upstairs, dragged the quilt from the bed and covered it up. My husband wondered what on earth was going on when he drove up in front of our house to the sight of what looked like a huge wigwam made out of our bedding. Anyway, he managed to find a kind male neighbour willing to help and, after a lot of puffing and panting, the treadmill graced our conservatory. But not before my husband had hurt his back. Is this ‘getting fit’ thing really worth it? My treadmill blog post got rather long, so I’ve decided to make two posts out of it. Treadmills Part 2 coming soon! 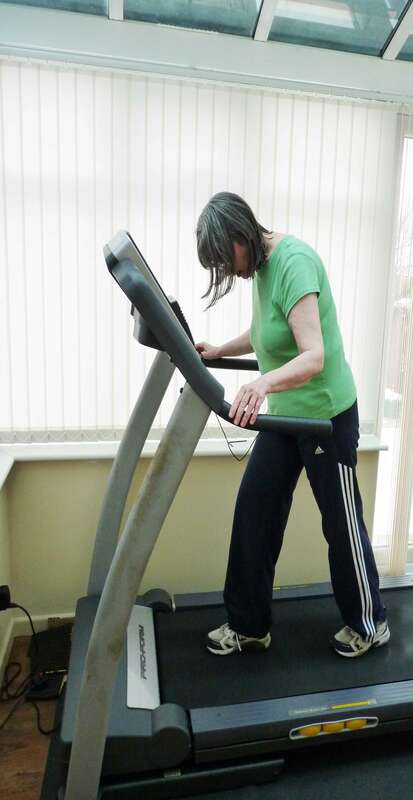 This entry was posted in Exercise and tagged health, keep-fit, rain, running, Treadmill by Jean Davison. Bookmark the permalink. Thanks, Ruth. I’ll be putting Part 2 up either later today or tomorrow. Highly amusing, I certainly did not know about the killer tortoise, sure there is a moral in that tale! It’s not clear from the photo whether you are resting or if that is where the radio is! Hi Sue, Thanks for this, but I think you meant to put this comment on my other post, the one called ‘Treadmills part 2: Miles With Smiles’. The photo on ‘Miles with Smiles’ supposedly shows me looking knackered after a tiring session.